I love prizes. Everyone loves prizes. Who doesn’t love winning a prize? So…I am deeply thrilled (and delighted) to announce that this very blog (my blog!) The People’s Therapist, has just been named a top mental health blog of 2017 by OnlineCounselingPrograms.com. So far, no statuette (although I’m clinging to the hope one might arrive in the mail.) But hey, it’s recognition, and I like recognition. Here’s the list of winning blogs (there are thirteen, and they’re listed alphabetically, so yes, I’m down there near the bottom, but that in no way reflects my comparative grandeur.) And yes, of course I urge you to take a peek at those other, dear little lesser blogs when you get the downtime. Because I’m gracious like that. Big-hearted. Classy. Anyway, here’s a nice long, special interview with moi-self, talking all about being The People’s Therapist, writing The People’s Therapist and reflecting the awesome glory of The People’s Therapist. Please enjoy. I want to thank Lauren Delapenha, and everyone at OnlineCounselingPrograms.com, as well as the lovely and talented rapscallions at AboveThelaw.com. But most of all (he says, barely containing his emotion) I want to thank you, my fans. I love you. And now, choking back sobs, I’ll step (with immense dignity) offstage as the sound of the orchestra swells in the background. My book about law and lawyers, “Way Worse then Being a Dentist,” has been referred to quite often as “indispensable,” “a classic” and, of course “required reading” for lawyers, potential lawyers, future lawyers and their friends, neighbors and the people who love them. But, naturally, there’s “required reading” and then there’s…required reading. And now I’m both. 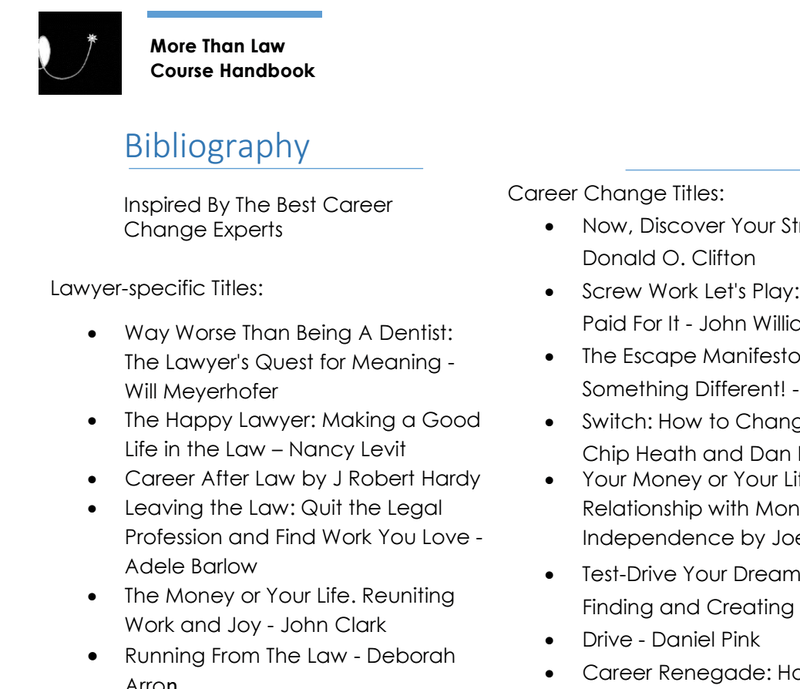 The lovely and talented Martin Underwood, of Life Productions, in London, UK has placed me right smack at the top of his “bibliography” in the handbook for his “More Than Law” course for lawyers looking to career transition. If you’re interested in learning more about Martin’s coaching and the course he offers through Life Productions, click here. Martin’s a clever guy, a former barrister with an Oxford degree and a winning smile, and I can’t imagine a few weeks spent doing what he tells you would be time badly spent. If you’d like to place a toe in the water, you might check out a webinar we recorded together a few months back. That was loads of fun – and you can listen to it here. I can’t summon my usual wit in this instance, folks. As a Jew and a gay man and a human being I’m humbled and moved and…well, thank you, Eva Mozes Kor. Thank you. The odometer rolled over today: 1,000,000 lifetime views. The People’s Therapist has joined the bloviating classes…I’ve now appeared as a talking head on a real live (sort of) television talk show – HuffPost Live. Anyway – here’s the link. The segment seemed to go well, although I had the unnerving if not atypical sensation of being the hot-headed radical spouting fire at a garden party. Hélas, c’est mon destin. At least my hair looked good. At least, I think it did. This time around, blessedly, the other panelists weren’t biglaw partners, law professors and authors of books with titles like “You can be super-duper happy as a lawyer if you just smile a lot!” Been there, done that. For a rather gloomier view of the current nightmare that is biglaw, click here. It must be admitted, it is fun to be on tv and get to talk. My new book is out. It’s a comic novel about a psychotherapist who falls in love with an alien from outer space. From start to finish… pure reading pleasure. Buy it at Amazon Bad Therapist: A Romance . Buy it at BN.com. Also available via the Apple ibook store. I look forward to the opportunity to meet more of my readers and share a few thoughts about the madness of biglaw. Hope you can make it. PS: If you’re in NYC On October 26th, 2012 and would like to hear me opine upon the divine absurdities attendant to biglaw, please come to the 2012 Fall Symposium of the National Association of Legal Search Consultants (NALSC), where I’ll be a featured speaker – information is available here. For information on my private practice, click here.